In my review of Speculative Japan 2, I said that I loved the anthology and couldn’t wait until the next installment was released. Speculative Japan 3 is finally here, and it’s everything I hoped it would be: a diverse collection of intelligent and beautifully translated short stories. Speculative Japan 3 opens with several shorter pieces. These shorter pieces, which range in length from five to twenty pages, run the gamut from hard science fiction to magical realism to fantasy with a sci-fi twist to elegiac horror. Fujita Masaji’s “Angel French” is about the romance between two deep space robotic probes who began life as two college students hanging out in Mister Donut. “To the Blue Star,” written by Ogawa Issui (whose novels The Lord of the Sands of Time and The Next Continent are published in translation by Haikasoru), is another story about a self-aware technological entity. This entity, whose name is X, is a collective intelligence made up of a fleet of robotic star cruisers that represent the last remnants of human civilization. X tells its own story as it travels through the universe, watches civilizations rise and fall, fuses with other advanced life forms, and finally meets God. Matsuzaki Yuri’s “The Finish Line” is a thought experiment in the form of a short story and features a quiet but chilling scenario of the end of all life on earth. Kamon Nanami’s “A Piece of Butterfly’s Wing,” which is probably my favorite story in the collection, is a beautifully creepy ghost story in the literary tradition of writers like Kurahashi Yumiko and Kanai Mieko. Like the work of these masters of the poetics of horror, Kamon’s story is filled with beautiful, atmospheric imagery and resonant symbolism. It also features a delightfully disturbing twist at the end. The longer stories of Speculative Japan 3 shine just as brightly as the shorter pieces. Even though none of these stories are more than thirty-five pages in length, they’re long enough to allow nuanced character development as they explore their premises in greater depth. Suga Hiroe’s “Five Sisters” is about a woman named Sonogawa Hanako who meets four clones of herself that have all been raised in different households. Each of these women has a different personality, and it’s fascinating to see how each has lived her life with the knowledge that she is a clone created to be harvested for organs. Ueda Sayuki’s “Fin and Claw” is a window into a future where humans have been genetically modified to be more adaptable to an environment covered in seawater. “Fin and Claw” is sort of like Jurassic Park with enormous sea creatures, and the moral of the story is the same. The last three pages of Ueda’s nightmarish vision are particularly terrifying in their visual imagery. The title story, Yamada Masaki’s “Silver Bullet,” is a Japanese Cthulhu mythos story (more of which are collected in Kurodahan’s Night Voices, Night Journeys). In my experience, there are two main types of Cthulhu mythos stories: pseudo-Victorian and classy, and unabashedly pulpy. “Silver Bullet” belongs to the latter category. Its protagonist is sufficiently hard boiled, and the story contains more cheap sexuality than you can shake a flagella at. Still, all of the story’s thematic elements mesh together nicely, the ending is well earned, and the method used to summon Cthulhu is awesome (as is the instrument used to stop the summoner). If there’s one story in the collection that feels out of place, it’s “Green Tea Ice Cream,” which is written by Mark Schultz. Perhaps it feels out of place because it’s merely good instead of excellent, but perhaps this is also because it bears the traces of awkwardness that often afflict stories written about Japan in English (a few of which have been recently collected in The Future Is Japanese). It’s difficult to pinpoint what the exact causes or sources of this awkwardness are, but it probably has to do with the writer feeling the need to explain certain “Japanese” things to the reader, as well as with the unstable balance between Japan as a real place and Japan as a fictional creation in these stories. “Green Tea Ice Cream” also revolves around a science fiction trope that I personally find silly and boring, namely, the unnecessary sexualization of a young woman who embodies fears concerning the changing relationship between human beings and technology. If the non-consensual impregnation and subsequent abduction of mindless machine girls is your cup of tea, though, knock yourself out. There are also some uncomfortably sexual father-daughter issues on display, if you’re into that sort of thing. That being said, the unsavory nature of the scenario and the characters of this story gives it greater depth and impact as a speculative commentary on contemporary bioethics. To counter the sour taste of “Green Tea Ice Cream,” Mori Natsuko’s “It’s All Thanks to Saijō Hideaki” is made of pure sugar. To give a summary would be spoiling the fun, so let it suffice to say that this is one of those stories that you can’t believe you’re reading while you’re reading it and then can’t believe you’ve read once you’re finished. The experience of reading this story filled me with joy. If you’re a fan of yuri or bara stories (or brilliant parodies of such stories), then this is the story of the elegant, fabulous apocalypse you’ve been waiting for. As in Speculative Japan 2, the translation is smooth and even throughout, with each story retaining the individual characteristics and quirks of its author. It’s a pleasure to read the stories in this anthology not just for the freshness and wonder of their ideas but also for the high quality of their writing and translation. 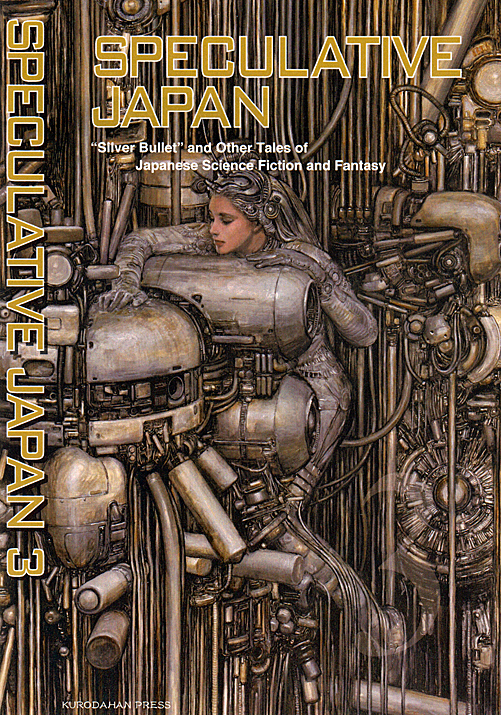 As both an anthology of contemporary science fiction and an anthology of contemporary Japanese literature, Speculative Japan 3 succeeds brilliantly in collecting not the newest or the most popular, but rather the most interesting and the best written. Speculative Japan 3 is an excellent collection of short stories, and I highly recommend it to anyone looking for intelligent and exciting new fiction, speculative or otherwise. thanks for posting reviews like this. Have I already commented, or did I imagine that? Can’t wait for this one as well – the first book was pretty good and it’s always interesting to read sci / speculative fiction from ‘other’ cultures – like finding out how other parts of ‘your’ mind think..